(Nanowerk News) In findings that took the experimenters three years to believe, University of Michigan engineers and their collaborators have demonstrated that light itself can twist ribbons of nanoparticles. The results are published in the current edition of Science. Matter readily bends and twists light. That's the mechanism behind optical lenses and polarizing 3-D movie glasses. But the opposite interaction has rarely been observed, said Nicholas Kotov, principal investigator on the project. Kotov is a professor in the departments of Chemical Engineering, Biomedical Engineering and Materials Science and Engineering. While light has been known to affect matter on the molecular scale---bending or twisting molecules a few nanometers in size---it has not been observed causing such drastic mechanical twisting to larger particles. The nanoparticle ribbons in this study were between one and four micrometers long. A micrometer is one-millionth of a meter. After 72 hours of exposure to ambient light, strands of nanoparticles twisted and bunched together. "I didn't believe it at the beginning," Kotov said. "To be honest, it took us three and a half years to really figure out how photons of light can lead to such a remarkable change in rigid structures a thousand times bigger than molecules." Kotov and his colleagues had set out in this study to create "superchiral" particles---spirals of nano-scale mixed metals that could theoretically focus visible light to specks smaller than its wavelength. Materials with this unique "negative refractive index" could be capable of producing Klingon-like invisibility cloaks, said Sharon Glotzer, a professor in the departments of Chemical Engineering and Materials Science and Engineering who was also involved in the experiments. The twisted nanoparticle ribbons are likely to lead to the superchiral materials, the professors say. To begin the experiment, the researchers dispersed nanoparticles of cadmium telluride in a water-based solution. They checked on them intermittently with powerful microscopes. After about 24 hours under light, the nanoparticles had assembled themselves into flat ribbons. After 72 hours, they had twisted and bunched together in the process. But when the nanoparticles were left in the dark, distinct, long, straight ribbons formed. "We discovered that if we make flat ribbons in the dark and then illuminate them, we see a gradual twisting, twisting that increases as we shine more light," Kotov said. "This is very unusual in many ways." The light twists the ribbons by causing a stronger repulsion between nanoparticles in them. The twisted ribbon is a new shape in nanotechnology, Kotov said. Besides superchiral materials, he envisions clever applications for the shape and the technique used to create I it. Sudhanshu Srivastava, a postdoctoral researcher in his lab, is trying to make the spirals rotate. "He's making very small propellers to move through fluid---nanoscale submarines, if you will," Kotov said. "You often see this motif of twisted structures in mobility organs of bacteria and cells." The nanoscale submarines could conceivably be used for drug-delivery and in microfluidic systems that mimic the body for experiments. This newly-discovered twisting effect could also lead to microelectromechanical systems that are controlled by light. And it could be utilized in lithography, or microchip production. Glotzer and Aaron Santos, a postdoctoral researcher in her lab, performed computer simulations that helped Kotov and his team better understand how the ribbons form. The simulations showed that under certain circumstances, the complex combination of forces between the tetrahedrally-shaped nanoparticles could conspire to produce ribbons of just the width observed in the experiments. A tetrahedron is a pyramid-shaped, three-dimensional polyhedron. "The precise balance of forces leading to the self-assembly of ribbons is very revealing," Glotzer said. 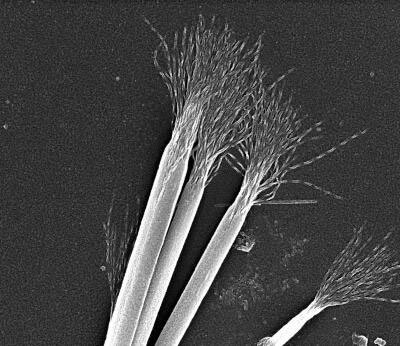 "It could be used to stabilize other nanostructures made of non-spherical particles. It's all about how the particles want to pack themselves."